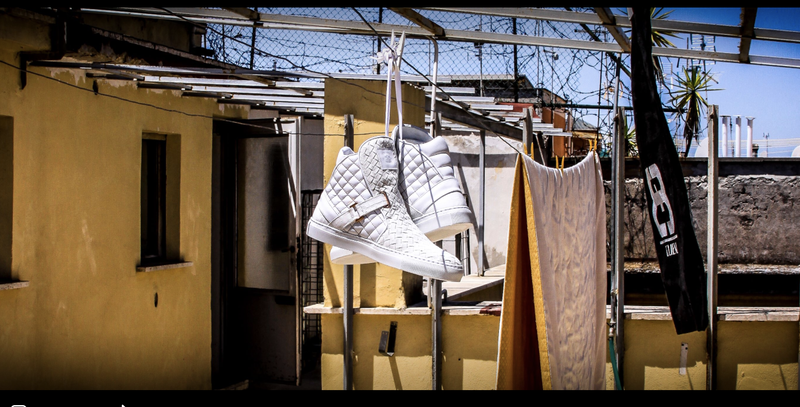 In your wildest dreams, would you change your life and your career and follow your passion all the way to Italy to design luxury sneakers? That’s exactly what this brother—who goes by the single name of Belieni (bel-ee-AH-nee)—did. Belieni is a self-taught designer from the Potomac Gardens projects in Washington, D.C. While enlisted in the U.S. Army military police in Iraq from 2007 to 2008, followed by Afghanistan from 2009 to 2011, “I had the epiphany to start designing for myself,” he tells The Glow Up. From his two tours of duty and a subsequent stint in private security, he stashed the cash to finance the dream of building a sneaker. Spalding Pumps with the basketball on the front were the first pair of sneakers that ignited his passion. As a kid, drawing was an obsession of Belieni’s as well as a way of indulging his knack for fashion and style. “I came out of my skin in my late teens and started showing people my drawings and realized by their reaction that I had something real,” he says. To be exact, Belieni launched with a high-top sneaker for men called the CalibreV1, manufactured by Italian artisan shoemakers (the women’s shoe releases later this year). The shoe looks like a cool-guy dress shoe, woven from nappa leather, accented with snappy rose-gold ceramic hardware set on top of a very streamlined, cushioned rubber sole designed to speak to the height of B-boy sneakerhead chic. The designer cold-called and emailed factories from Los Angeles to Italy until he found a fit. New designers are always a risk for any factory, whose main concerns are securing regularly repeating high-volume orders to keep the assembly line going and its workers paid on time. If a new designer’s shoes don’t sell through, factories often get stuck with the inventory and the balance of production costs. Fledgling shoe designers often have to find factory fairy godmothers or godfathers who believe in the designer and are willing to take the risk. “It was my technical drawings that convinced them,” Belieni says. Belieni’s shoes are made for the mid-20s to 40s young professional who needs something that’s not a sneaker to wear to a meeting but doesn’t want to sacrifice comfort or cool when it comes to getting dressed for business. With athleisure on the wane and being replaced by relaxed suits on designer runways, this may be just the right moment in fashion. Celebrity supporters are beginning to step into Belieni’s arena as well. “Michael Thomas from the Miami Dolphins, he didn’t mind promoting my shoes—he actually wore them to the BET Awards as well. Masika from Love & Hip Hop wears my shoes; we are looking to ink a collaboration deal with her for our women’s line,” he says. While the business may now be up and running, it’s not without challenges for the tight three-person crew, which includes his fiancee serving as the company’s financial officer and a third employee charged with marketing and social media. Social media is the part of the business that is most foreign to Belieni himself: a refrain we’ve heard from most designers about building a business. Will Belieni be able to get a foothold in the athletic-footwear market, currently estimated to be worth $80 billion globally, with an expected 2 percent market share growth predicted between now and 2024? At a cool $550 a pair, that remains to be seen, but if this young company’s record is any indication, we could be looking at a winner. Editor’s note: This post has been updated to note that Belieni served in the Army, not the Marines.